Opened in Hanoi late last year, Quintessence of Tonkin has all the makings of a world-class performance. But the show has a loftier aim: to celebrate the history and heritage of Tonkin, an agricultural region in northern Vietnam. 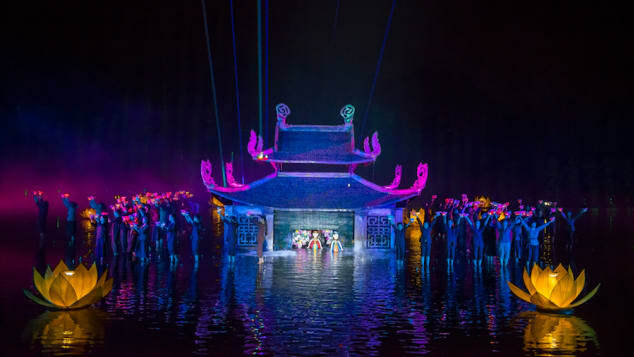 Staged entirely on water, the open-air performance provides a broad overview of village life, from folklore to music, poetry, water puppetry, Buddhism and more. "When doing the show, I feel very proud of my country. My beloved country, Vietnam," director Nhat Nam Hoang tells CNN Travel. "We have many good things that we call quintessence. This is a good chance for us to introduce the culture of Vietnam around the world." Dating back thousands of years, the Tonkin region is among Vietnam's many rice bowls. Inspired by this deep farming culture, Hoang set out to create a contemporary show that would preserve local art, poetry and traditions. And who better to tell the story of Tonkin than the villagers themselves? Hoang hired retirees, farmers and residents from the Quoc Oai area, just outside of Hanoi, to perform on stage. Inscribed by UNESCO, Mother Goddess worship involves channeling female deities in a Vietnamese ritual filled with music, singing, dance and costumes. "We have a total of around 200 performers for the show. We have 120 farmers from the local (community) and 70-80 dancers from the College of Dance in Hanoi," explains Hoang. "In the beginning, it was really hard for us to gather the farmers .... But I think they have passion in their blood, and they work so hard with me and my team day after day." A retired construction worker, 70-year-old Thi Son Nguyen is among the performers. "The show is a great way to show that our local authorities care about the elderly and seniors like myself," Nguyen tells CNN Travel. "The work is not hard labor at all, more like a fun activity. It's also a nice source of income." The Quintessence of Tonkin show takes place nightly, about 40 minutes outside of Hanoi. It all takes place nightly in an immense rice field, about 40 minutes from Hanoi. A backdrop of mountain scenery, replica village houses and pagodas set the scene. But the highlight is the partially submerged stage -- a feat of engineering. Essentially, a hydrothermal system sinks and lifts parts of the set, such as a replica pagoda that appears to emerge from the depths. Each performance traces the story of a respected monk -- Tu Dao Hanh -- who founded the ancient Imperial Citadel of Thang Long in Hanoi, while incorporating various aspects of folk culture and music. Hanoi's Thanh Chuong Viet Palace features elements from 54 ethnic groups, making it one of the most comprehensive catalogs of Vietnam's cultural history. "I think the show is a truly meaningful act to honor Tu Dao Hanh, a compassionate monk who healed the impoverished sick and asked for no payment in return," says Nguyen. Along the way, the scenes incorporate six traditions and values of Tonkin culture: poetry, Buddhism, nostalgia, music, painting, joy and festivities. In one serene scene, for example, a group of young women play various instruments -- including a lute, fiddle and harp -- while visual effects project fairies fluttering across the lake. "For the first time, I guess that the farmers can do anything," says Hoang. "They're not professional dancers, but when we practice every day and, especially when the audience comes and all the lights and sounds are on, they become the other."